A long time ago, I was taught that an apology can go a long way towards repairing a broken situation. Just apologize so you can show that you care and that you are sorry for what happened. I've kept this in mind for years and years. Sometimes it works and sometimes it does not. Apologies during a disagreement work best when they are heartfelt and they are include admission of a mistake by the apologist. For example, "I'm sorry I didn't handle that situation well. I did a terrible job of hearing your needs. I should not have ignored you. I should have listened to your needs better and found a way to help you." Apologies during disagreements are meaningless when they don't acknowledge your own actions. The most common is, "I'm sorry you feel that way." If we are really close, I can appreciate the sentiment. If we are friends or family, and you want me to know that you feel badly for the way I feel because you care about me, those words make sense. 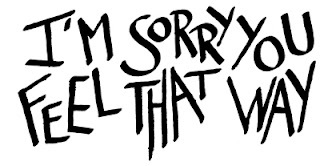 If we are really close, telling me you are sorry is really just commiseration or sympathy. If we do not have some type of close relationship, please don't apologize for the way I feel. "I'm sorry you feel that way," is not an apology.